Santa Catalina is about an hour and a half drive South Southwest from Santiago. Whether you are coming from Panama City or David, you will travel through Santiago. If you are driving from Panama City to Santa Catalina, plan on a 5 to 6 hour trip, but allow 7 to 8 hours in case of construction, rain, or side trips. Plan to arrive while it is still light because the roads are used as sidewalks by the locals and livestock is frequently loose and roaming the roads. This is particularly true of the secondary roads between Santiago and Santa Catalina. The 3 1/2 to 4 hour trip from Panama City to Santiago is a pretty straight forward drive down Highway 1, know as the Pan American Highway. The speed limit is 100 km/hr along the rural parts of the highway, but drop frequently to 60 km/hr or less. This highway is heavily patrolled and keeping aware of the limit change is a very good idea. The most difficult part of the trip is finding the turn for Soná. It involves several turns through town. The first turn is to the left about half way through town on Avenidad Central. It angles at about a 45 degree angle and is not well marked. Avenidad Central will take you through the main shopping area and run directly into the Cathedral. At the Cathedral, turn right and immediately back to the left, following the side of the Cathedral. In one block (at the back of the Cathedral) turn right. 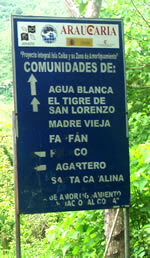 Continue for 2 blocks and turn left where a small sign points to Soná. The road to Soná is 2 lane and rougher than the Pan American Highway, but generally in good condition. Typically, it will take 30 to 45 minutes. As with any secondary road in Panama, watch for pedestrians, bicycles, livestock, wildlife and the unknown! It is a picturesque drive with rolling hills and farms. Shortly before entering Soná there is an intersection with a Shell gas station on the corner and a large number of signs. Guide books tell you it is a well marked turn, but the sign may have damage. The gas station is a better landmark. A left turn here puts you on the road to Santa Catalina. If you need cash, bottled water, gas, food, or supplies. You should stop here or drive the short drive into Soná. There are few to no options in Santa Catalina for these items. This part of the trip offers views of a number of local villages where the residents live in thatch huts, ride horses, and work on the large “fincas” or agricultural units in the area. While the road is in good condition and the winding nature of it tempts the race car driver in you, caution is the rule of the road. Anywhere along the way, the road could be lined with chickens, people, cattle, horses, or wildlife. It is a pretty drive. Drive slow enough to enjoy it! The recently paved road to Santa Catalina makes 4 wheel drive no longer a necessity. About half way to Santa Catalina, you will make a left turn at a well marked intersection. Straight would take you to Los Tigres. Plan on the Soná to Santa Catalina portion of the trip to take at least an hour.